Very cozy and bright apartment in a great location, close to the Shopping Center Alto Palermo, Cinema Complex and just two blocks from the subway (Bulnes stop), in an area surrounded by coffee-shops, restaurants and parks. This apartment is only a studio situaded on the 19th floor. It has two single bed possible to make a double bed, equipped kitchen and a complete bathroom. 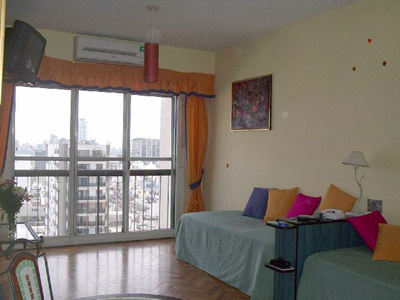 High floor, hardwood floor, air aconditioning, cable TV, refrigerator, kitchenware, microvawe. Linens and towels. Subway, Bus Stop, Gym, Cinema, Restaurants,Pubs, Botanical Garden, Park, NightLife area, Residential Area, CyberCafe, Bank, Exchange House, Bookstore. Included: Electricity, Gas, Building fees, City Taxes, Cable TV, Telephone, Water, Cleaning service.